AIG posted its 4th Quarter 2008 earnings on Monday, and as expected, they were dismal. The company also divulged the arrangements for its revised bailout package by the U.S. government (also expected). In an interview on CNBC, AIG CEO Edward Liddy explained the revised package rather well. He said the continued restructuring of the firm is progressing, but as the world economy has been hurt, AIG has found it more difficult to sell off rather valuable pieces of its company. 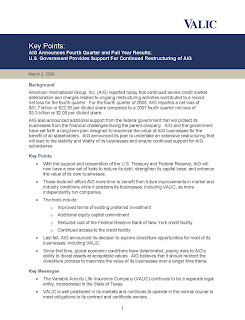 This being said, the new deal is essentially a package that allows AIG to continue functioning without issue, and it also allows AIG some time to divest itself of the "non-core" pieces of the firm. AIG VALIC is one of these pieces of the non-core business. 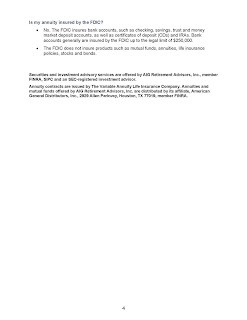 Below is a press release direct from AIG VALIC discussing the earnings report, outline of the U.S. government's help, and future plans. 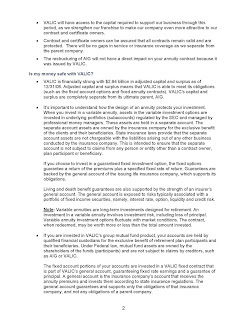 The press release also details that VALIC is a "separate legal entity" from the parent company (AIG). Essentially, VALIC in its current state and any future sale of VALIC should have no effect at all on any contract owners. I would also like to point out that any loss in value in your AIG account(s) almost assuredly has to do with the mutual funds (subaccounts) held within your account and the decline in the stock market. This is an important distinction that should be made. 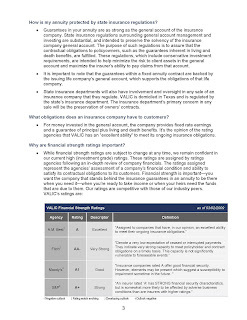 The following images are the press release direct from VALIC on March 2, 2009. You may clink on any image to enlarge it. If you wish to get the PDF directly from AIG VALIC, please click here.